Bigfoot wasn’t very elusive this Saturday in Longview. His face was printed on countless t-shirts and paintings, his footprints were captured in casts taken from around the Pacific Northwest, and the 8-foot-tall creature himself even stopped by to take pictures with families — or at least, someone looking like him did. The second-annual Squatch Fest drew over one thousand fans of the mysterious Sasquatch. 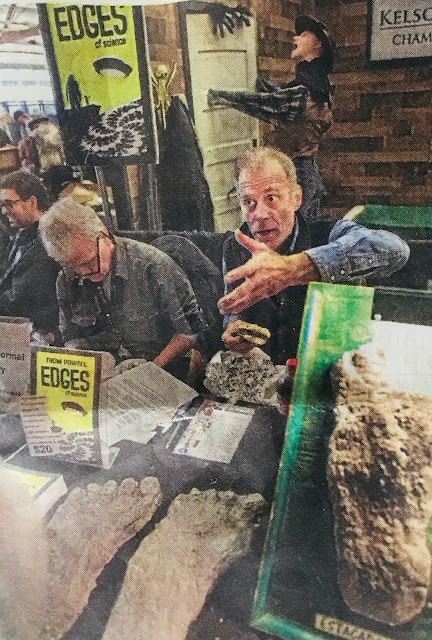 They crammed into the Cowlitz County Event Center for a festival filled with food, beer and serious discussion of the often sought-after but rarely seen creature. More than 50 food vendors and 10 breweries set up shop to nourish the hungry Squatch seekers, who visited from all over the country. Last year’s Squatch Fest drew attendees from as far as Texas and Virginia, according to Bill Marcum, CEO of Longview’s Chamber of Commerce. While Squatch fanatics and agnostics alike attended, it was the “True Believers” — those who shared personal encounters with the mythical, reclusive — who captivated an audience of hundreds. Ron Morehead, a self-published author and self-proclaimed Bigfoot researcher of more than 45 years, played recordings containing ape-like grunts and roars as evidence of a Sasquatch language. At one point, the creature in the recording seemed to have a coughing fit. “I’m not sure, but I think he had asthma,” Morehead said as the audience laughed. Dana Lynd, a painter from Spokane, said her fascination started when her brother took her to see “The Mysterious Monsters,” a documentary on legendary beings like Bigfoot. She said she later had an encounter where she heard a Sasquatch hitting and pounding on the side of a building. Being surrounded by so many other believers was “comforting,” Lynd said, as many people don’t give a second thought to Sasquatch stories. “Here, everyone wants to hear your experience,” she said. Beyond sharing stories of encounters, the event also provided an opportunity for friendly debate among Sasquatch seekers. Bianca Baughart visited from Portland with two friends. She swapped ideas and theories about Sasquatches with others at the events, including the idea that Bigfoot might be a vegetarian. Baughart’s advice to aspiring Bigfoot seekers: Take a night drive around the Columbia River Gorge. If you begin to feel the presence of Bigfoot, trust your instincts. Just about every believer had their own theory as to the Sasquatches’ origin. Some believed they hid in forests and played tricks on humans, or that they were the offspring of ancient humans and more ape-like creatures. Others thought they came from under the ground or over the seas. 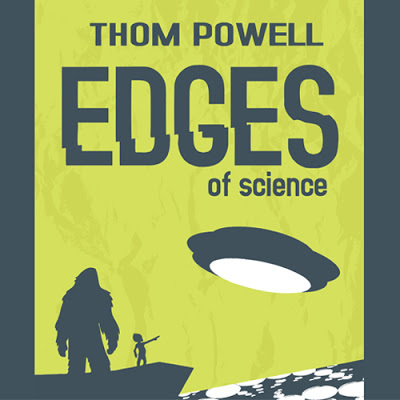 For Thom Powell, a science teacher and Sasquatch researcher who spoke at the festival, Bigfoot’s origin could only be explained by the paranormal. Powell said that the lack of conclusive physical evidence of Bigfoot means further research is required. He pointed to a set of casts of Sasquatch feet, taken from forests across Washington, Oregon and Idaho. The more imperfect tracks, he said, are more informative, because they tend to show more movement and walking style compared to cleaner tracks. He suggested that the more aesthetically perfect tracks, which don’t reveal much about the creatures’ biology, might be left behind by crafty Sasquatches as a prank. “They’re way smarter than we realize,” Powell said. Jedediah Aaker, a custom button maker from Portland, said he’d been to four previous Bigfoot festivals. He said hearing people’s personal stories first-hand is what keeps him coming back. Hangin' out after hours at the Squatch Fest Conference.